This is a bit of a 'dump all the links in one place' page for people who may be interested in the specimen of Goliathus goliathus that has most probably been shot. "The obvious puncture marks and cracks breaching its armour are, I believe, tell-tale signs that the last thing this particular beast saw was the wrong end of a Victorian big game hunter’s blunderbuss!" Max Barclay (Twitter) had pointed this out to me a while ago, and I introduced Max and Heather Bonney (Twitter) one evening in The Queen's Arms. Then the BBC got involved and the story became a bit of a hit (even if I have not been mentioned to date, anywhere!). Eventually we will write up a more scientific account of the story for publication. It should be pointed out that there are some extra points that have not been published anywhere to date, and we would like to (and plan to) do some further investigations. There are some Flickr photos I took while Heather and I figured out the best settings for the x-ray machine. The Natural History Musuem's press release can be downloaded here: Who Shot Goliath. New Scientist - has stupid URL structure, you will need to go back to 11th March 2010 if they have added new images since I made this post. We like publicising our science, and Twitter is great. Although sometimes I can't help thinking I should have paid more attention to Twitter at the time! Please leave links to any missing resources as a comment! On the 6th April I gave a talk as part of the Cafe Scientifique series at the Photographers' Gallery in London, chaired by radio presenter and psychologist Claudia Hammond. The main topic of the talk was the mimicry complex of phasmids mimicking leaves and twigs, their eggs mimicking seeds, the eggs being taken into ants nests to protect them from parasitic wasps that may mimic ants, and the hatchling phasmid nymphs mimicking ants. We know very little about this system (even less than we know of the ecology of the stick insects and wasps), but I am keen to find out. (More about this later). After the talk there was a question session which addressed some further points about mimicry, the danger of studying species in isolation from the species they interact with, and a bit about cockroaches (with some help from David Nicholson who I am doing some Nature Live talks with in May). 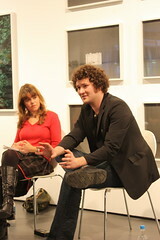 There are some more photographs of the event on my Flickr set Cafe Scientifique. The video about the Giant Prickly stick insect on Discovery News has one major problem. Adult stick insects cannot regrow lost limbs. 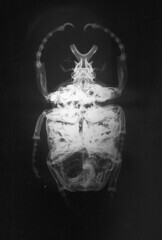 Nymphs are capable of regrowing lost limbs, and over a period of moults it may even reach the same size as the normal adult legs. As adult phasmids no longer moult, they can no longer regrow shed limbs. Several groups of people club together to purchase milk, coffee, biscuits etc. We have traditionally labelled everything 'Orth.' after orthopteroid insects. 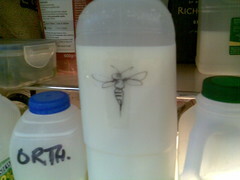 Looks like the hymenopterists have shamed us with this artisitic creation.